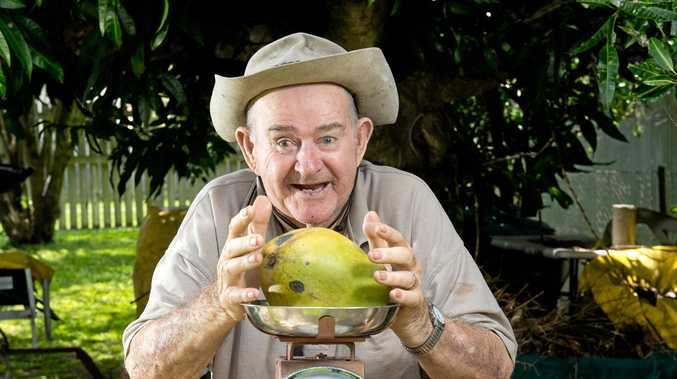 WHEN retired painter Bill Willis stumbled into his backyard on Tuesday morning to inspect his prized mango tree, a behemoth awaited him at his feet. Unable to withstand the sheer weight of the 1.5kg monster, the branch bearing the biggest fruit he had seen on his Walkerston property collapsed; surprising the awestruck 82-year-old. "About a 1kg one is rare - I've had about three of those - but this one I didn't even know was on the tree," Mr Willis said. Having planted the tree around the time of his retirement more than two decades ago, Mr Willis' history of farming and pruning dates back to his father; a sheep-shearer who distributed wool for the military during World War II and kept his sons busy on the family property. The tree stands impressively and grows several significant mangos, however they pale in comparison to his cherished masterpiece. Mr Willis said slow irrigation played a role in producing the colossal fruit, however, even still he could not fathom exactly how it became so immense. "I couldn't waste any water because it wasn't raining; it needs that because if there is none it won't blossom," he said. "They all respond to a bit of treatment, (but nature) will take care of the rest. "It's up to the conditions - if the tree is healthy it'll do its best for you." Christening the gargantuan mango Norman, Mr Willis' intentions for the fruit are simple: a bowl of ice cream and, judging by its size, days worth of the delicious dessert. However, plans to sell his extraordinary produce have never crossed his mind. "If people enjoy them, help yourself. I'd hate to see them go to waste."